Next time you click on a “Full text online” link in Summon (and other library databases including PsycINFO) that looks like this you may see a screen that looks like this Any reasonable person would suspect something is terribly wrong. The fact is that, somewhat unfortunately, a link that says “Click this link to display full-text in a new window” no longer displays in the big empty spot. 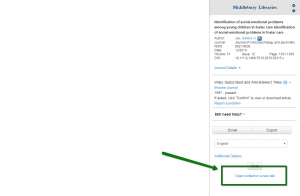 Instead, there is now a very small link at the bottom of the narrow frame on the right that says “Open content in a new tab.” (additional screenshot below) If you click that link, you will (hopefully) see the journal article you are looking for. This entry was posted in Library, Post for MiddPoints and tagged Summon on February 5, 2018 by Arabella Holzapfel.